Treating everyone equally is a noble act but in a purely commercial setting, treating every customer equally does not make good business sense. Marketing resources are scarce and it doesn’t make sense if you set aside the same amount for every customer. Would you allocate money for both ventures when one gives you 12% and the other merely 3% return? All things being equal, the answer is a resounding no. You’ll probably put more eggs in the basket that brings you greater yield. Many industries practice customer segmentation, with the banking sector being one. Clients are segmented internally according to the AUM (assets-under-management) individuals maintain with the bank. Most banks will accord individuals “privilege banking” status if AUM of $200K to $250K is maintained with the banks. For corporate clients, banks also segment SMEs with turnover below $20M under ‘small business loan’ segment. Companies with annual revenue over $20M are usually segmented under ‘medium enterprises’ segment. Interest rates, SME loan products, access to dedicated relationship manger etc are affected by the business segment your company is classified into. Your customers can be viewed the same way. There are those who give you more profits while there are others who’ll give you smaller returns. It is only fitting to focus more on the vital few rather than the trivial many. But you don’t have to drop clients on the bottom rungs. You can spend for all, but you have to choose which ones deserve the “red carpet” treatment. Try to segment your customers based on the streams of income they bring into your business. From there, decide how much you’re willing to farm out to each segment based on the yield each segment brings you. You’re basically applying the 80/20 rule when practicing customer segmentation. Look at your debtors list or your product/service list. You might probably find that roughly 20% of your customers or products/services actually bring you approximately 80% of your revenue. This is referred to as customer segmentation. Demography, geography, and behavior are some of the basis for grouping but the focus of this discussion is segmentation based mostly on purchasing habits and eventually the earnings you get from this particular behavioral tendency. 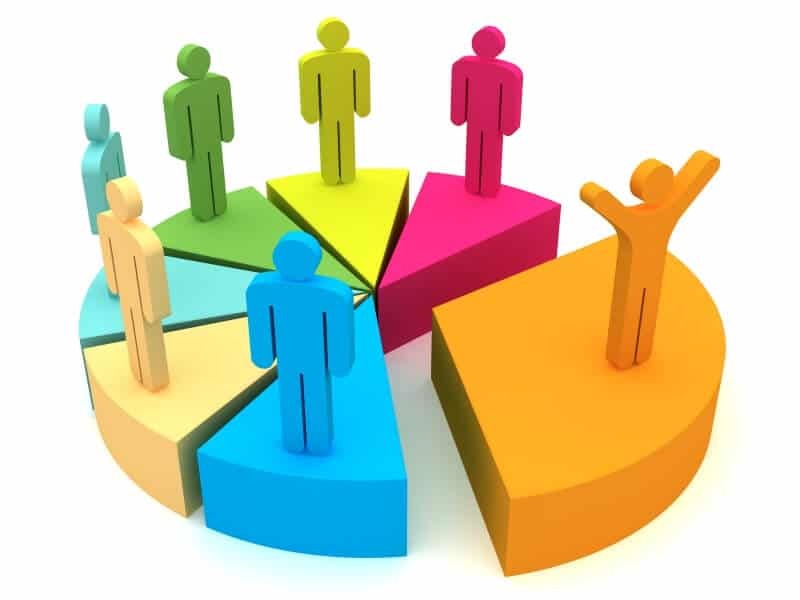 How to take advantage of customer segmentation in business? The first step to customer segmentation is to prepare a list of your customers. Opposite each client, indicate the amount of revenue they have contributed and your gross margins on their spending. If you have an existing client management system, you can easily generate a list based on your profits per client on a given period. Your yearly sales per client are a good example. This may be more applicable to B2B companies as most B2C small businesses in retail or FMCG industries should see a pretty even spread of spending across all customers. Now that you’ve sorted your customers by annual sales, you might find yourself looking at a very large list. Try to narrow down this list by keeping the 80/20 principle (or Pareto Principle) in mind. In this case, the rule tells you that merely 20% of your customers would have been responsible for 80% or more of your annual sales. So focusing on the needs of this group may be more critical and practical. You can now draw marketing tactics based on this info. You know which group brings in the largest income streams thus making them more valuable to your business. This info will help you meet their needs following a hierarchy. Of course, the needs of those on the topmost – the biggest spenders, must be addressed first. Customer segmentation helps you spend smartly on marketing and promotions. You have identified which group are the top earners for your business. When giving out holiday gifts as a part of your promotional campaign, be more generous to your top clients. For instance, gift baskets for prime clients will have top of the line gift items. Spend on the packaging. Make it more personalized and custom-made. On the other hand, give quality but less expensive gift items for “regular” clients. You can still convey appreciation for their patronage without really spending too much. Smother your valued clients with special treatment. After all, they are the cream of the crop and therefore they deserve the best bargains. Products and services should be made available to them at easier, more flexible terms in the form of discounts, incentives, and other special offers. This will help you maintain good working relationships with them and even promote loyalty. Meanwhile, this will encourage your regular clients to make it to the roster of “top” clients, allowing them to avail of “extraordinary” privileges. Of course, it’s expected that you and your sales team are on the same page. Share this list so they are aware of “who’s who” among your clients. Usually, these clients would be in the top two of your list. By identifying these customers and disseminating this info among your sales team, marketing campaigns could be focused more on the top and less on the bottom. Your clients and you save time because your sales team will know how to handle your valued clients. Top clients don’t have to go see you just to get price concessions from the boss. You’ve made your position very clear to your team so they would be negotiating prices with top clients the way you would. When sending out messages about special promos, it is certainly fitting to prioritize your most valued clients. They should be the first to know and the first to avail of your promo. Also, you may want to limit your promotional discounts to valued clients only. Since you will be spending on advertising to attract and maintain valued clients, make sure that you spend more advertising money for this group. It is all right to spend more on them if the payoff is a significant increase in sales and client retention. But this doesn’t mean you’re going to ignore the others. You will just have to spend less on this particular group. If they turn to the next seller, at least the amount you’ve spent for this group was just a drop in the bucket. Forget about pleasing everyone and treating each client equally. In business, the practical business owners are the ones who stay afloat and thrive. In the current economy slowdown where it is tougher for SMEs to access credit from banks, it is critical for SMEs to improve revenue within existing clients. Through customer segmentation, you’ll be able to make practical and informed decisions, spending more on the huge spenders. Once you’ve focused on the “vital few’ you are on your way to fostering bigger payoffs.